How do you sort the good from the bad when selecting tenants? Do you check previous landlord references? Run a credit report? Verify employment? There’s a way you can save about 47% of the time you spend faxing, emailing, and calling to verify tenants. 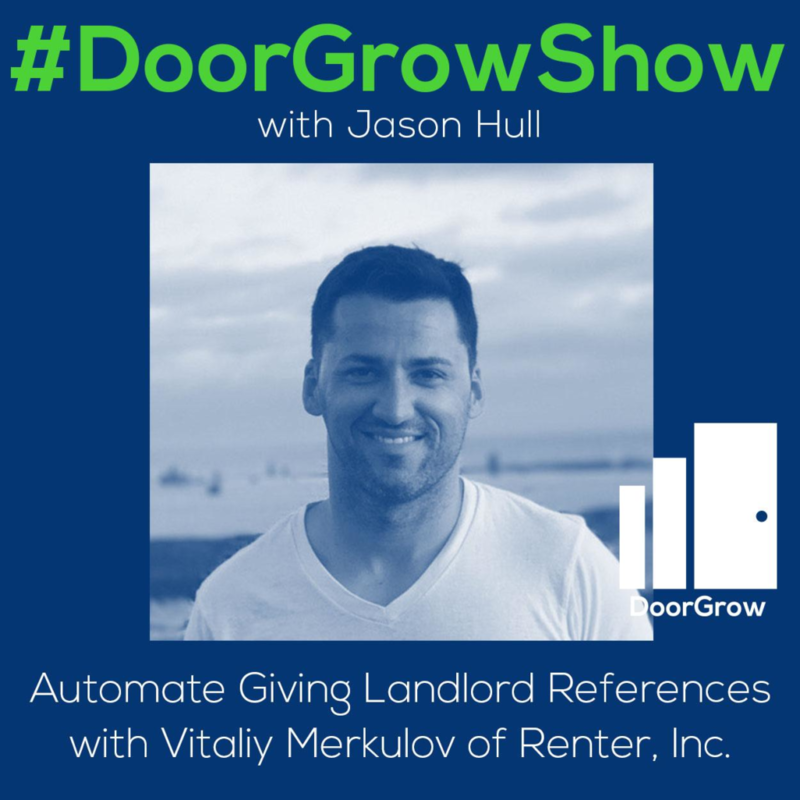 Today, I am talking with Vitaliy Merkulov of Renter, Inc. about how to automate giving landlord references and rental verifications. [02:10] Vitaliy’s move from the tech industry to property management. [02:57] First Tenant Fail: Fake landlords and fake information. [04:10] What did I do wrong? How can I prevent people from doing this?. [05:50] Solution: Create SaaS way of requesting or sharing rental verifications online. [06:41] Property manager’s biggest problem without automation? Compliance. [10:20] How fake companies fool tenant screening companies. [14:00] Reference requests require identifying owner of property. [15:12] Registering an account to post online rental verification request form. [17:51] Plans to partner with property management software companies. [23:41] Problem with Property Managers: Trying to do everything and not being effective. [27:20] Apple’s client-centric focus with its products to solve problems and be profitable. [29:18] Simple design, so users don’t get stuck; automation sounds difficult, but you don’t have to be hi-tech savvy. [34:15] Ask: What’s the biggest challenge or problem you’re dealing with in your property management business?. [38:37] Storing information in a database to give to other landlords, is that legal?. [39:22] I trust myself, not a system, to do rental verifications. [40:20] API purchase not required; “robot” analyzes information and converts it into data. Today’s guest, we have Vitaliy Merkulov. Did I say it right? Jason: All right. I did it, awesome. Vitaliy is here from Renter Inc. and he has a rental verification software, but before we get into that, we’re going to be talking today about giving landlord references, or providing rental verification, and how to automate this. Before we get into that though, give us a little bit of background on you so we understand how this all started. Vitaliy: Sure. Well, thank you so much for having me on the show. I’m really happy to be here. I definitely listen to a lot of your podcast and you’re awesome for doing this. With that said, I have a lot of background in tech. I used to work for Apple, Intel, Sharp, and some of the other companies. I have about 10 years of experience doing that. While I was working and doing that, some of my friends were investing into real estate. Basically single family homes, duplexes, some have been investing in apartment complexes, and they were saying like, “Hey,” this was about 2012 where prices were good. I ended up buying a duplex for myself. Basically, I didn’t know anything about screening tenants, or anything about property management, I was just trying it out. I ended up accepting a tenant that I thought I did a good job screening. I called the previous landlord, I ran their credit, even did their employment verification. Everything seemed to be really good, but what happened is afterwards on the second month that I came to collect the rent, they simply said, “Hey, by the way, we know the system. We’re not going to leave, and we’re not going to pay you anything,” so what happened is, they basically faked their rental verification. They knew the system, and they actually asked their friend to act as a landlord, and knowing how that all works, you probably are aware of how that works. Actually here in California, it took me three months to get them out. I eventually evicted them, but out of anger for me, they flooded the first floor, so I had to change all the floors, and everything. It cost me about $11,000 just because of these tenants. I tried to figure out, what did I do wrong? I tried to figure out, why is there a way for people like me to get in the situation. I started looking around and I figured out that we need some kind of place for all these tenants, bad tenants to be reported to. It basically went on and on, and I realized, I need to fill that gap with my tech knowledge. Honestly, now that I’m in it, I wish I knew how complex this whole system is. With that said, I started building a national database for bad tenants and realized that that’s illegal. I talked to a bunch of attorneys and figured out a way to do it legally. What happened after is, I realized there’s no way to make this work unless there is thousands and thousands of people on the database already. What we did is we decided, instead of trying to build this database which would be a good thing, we’re going to figure out how we can offer great services to property managers, apartment complexes, and small landlords, to give them some kind of service to help them, and also what’s going to happen is we’re going to start building a database while we’re helping property managers. With that, we talked to a lot of property managers and decided, there’s a lot of credit reports that are automated there. There’s employment verification that’s automated there, but there is no SaaS way of requesting or sharing rental verifications online. That’s what we’re solving basically. We basically allow people to share rental verification through our system which allows people to be compliant with HUD, and also it saves about 47% of the time to do it rather than faxing, emailing, and calling. I hope that kind of gives you an idea of how we got here. Jason: Let’s talk about the problem first, because businesses only exist if they can solve the problem. What’s the problem that property managers might be dealing with, or that they deal with, related to automating this? If they don’t have this automated, what’s sort of the issue that you typically find that they’re dealing with? Vitaliy: One of the biggest issues is compliance. There’s laws that change all the time, especially here in California, that restrict property managers and landlords to share certain information about them. If a property manager does not keep up with it, then they can get into a lot of trouble, legal issues of sharing information that they were not able to share, that is a big problem. The way we solve it is we have a standard HUD compliant form that we share with everyone, and those are the only questions that landlords are able to share. What that does is it prevents property managers from sharing information that they just can’t, or have a chance of being sued for. Jason: That prevents them from asking anything that they don’t need to know, or shouldn’t know, or be asking anyway. Vitaliy: Yes, so it’s more of providing it, not asking, but this is when somebody comes to you and says, “Hey, I want a rental verification, so and so, they lived at your property, now they’re applying at my apartment, or my single family home. I want to get a reference from you,” and if your assistant is not trained on fair housing compliant, or you haven’t updated them with the latest laws, they might share information that could get you in trouble. That is what it’s solving, the biggest thing. Jason: Let’s share an example. What are some things you can’t ask when you’re trying to check on a reference? Vitaliy: One of the things we see people ask here in California is, how many people lived at the property? That would be discrimination against the size of a family. You could get in trouble for that. That’s one example. We can’t ask about dogs or animals. There are certain things you can ask. A good example you probably talked about with pet screening episode that definitely went into details on specifically what questions you can ask about that. There’s a lot of different things that you can and can’t ask. Jason: Interesting. How does this help them? How do we automate this? How do you make this so that it’s something that is more automated. It sounds like a very manual process and labor intensive process. Calling, following up, faxing stuff, emailing stuff, and then trying to verify whether any of that stuff is accurate or real. Like in your instance where you ran into that initial problem that kind of sparked this idea, fake landlords and fake information. How do you help with all of that? How does how does this happen? Vitaliy: Yeah, great question. Among a few forums that you guys are on to, Fred Larson’s forum, and people are always asking questions there. One of the things people don’t know is there is actually real companies that do fake rental verifications for you. Tenants hire them and they ask them the right questions, tell them exactly what they need to know. The move in date, move out date, everything a property manager would ask them, and basically what they’re doing is, they’re faking a landlord. That’s a big problem. Jason: Wait, so there’s companies that renters, potential renters will pay to pretend, to give them some rental history. Jason: They just make it up. Vitaliy: Yeah. What they do is, if you just go on Google and type in fake landlord reference, you’ll see a bunch of companies. At least I know two of them. I don’t know them on top of my head, but they’ll be on the top, and basically they’ll say, “Hey, if you want a fake rental verification, contact us,” and these people, they know what property managers are asking, and they usually ask like, “Hey, when did they move in? When did they move out? how much rent do they pay?” and if they answer the right questions the right way, then the landlord, or property manager says, “Okay, so they must be the owner because they answered these questions,” but this company ask those questions ahead of time so they’re prepared to fake the property manager, that they’re a landlord for them. They’ll give them all good references like, “Yeah, they pay on time,” everything, but they’re not even contacting the right person. Vitaliy: I’m not sure what the legal side of that and how they work, but these companies are able to pull latest sales information and everything, so they can fool pretty much any tenant screening company that calls, or property manager. Vitaliy: They are, and they’re in business of doing that. The only way to verify them is to check if you’re actually talking to the correct landlord. First, you have to look at the property owner’s information. Let’s say 123 Main Street by public records is owned by Jason Hull. Now, you got that. Jason Hull is the right owner. Now, what is their phone number? Am I even calling the right person? These companies actually go all the way out if you get the premium package. They’ll actually create a fake property management website with the phone number and everything to make it look like it’s real. Vitaliy: Yeah. Property managers have to rely that, “Hey, they’re not in business of being an investigator to try to figure out if the landlord is true or not. They have to rely on facts,” and the only facts that you can do is, you can look up property ownership, or ask them to provide some kind of proof of ownership. What we do with our software is, whenever somebody requests a reference, we have to, based on the fair housing compliance, identify that they are an owner of that property and they have the right to share that information. Jason: My question is, when you’re going through in doing this process, and you’re helping to automate this for a property manager, I think when people hear you say that you automate this, that it’s all done by a robot, it’s all done through an email, and that probably makes them feel even less safe. So how does this actually work? How does your team, or your company, or your system, how does this happen from the time that they entered into your system, that they have a new tenant, they’re trying to verify this tenant’s rental history, and everything that they’ve been told. What then happens next in your business? What do you guys do then? Vitaliy: The way it works is, if somebody wants to start using our system, they basically go and register an account with us, and what we do is, we give them a special online form that they can then share on their website. Basically, what our customers usually do is they say on their contact us page they say, “Hey, are you looking for rental verifications? Click here.” So instead of them calling them or faxing them and asking for rental verifications, they have a form that they can go to and fill out a request for rental verification. Let’s say they fill out a form and they want a rental verification from a property manager, they fill out the form, upload a consent form, because that’s required, and what happens is an email is sent to the property manager saying, “So and so is requesting your reference,” there’s a big button there that says, “Provide a reference.” They click on that button, and that takes them to an online form which is a HUD-approved form, and it basically asks you fact-based questions such as, move in, move out date, how many times they were late, if they had unauthorized animals, pets, and a bunch of other questions that are relevant, and then they hit submit. What that does is it generates a PDF report and a web report that is automatically sent back to the person who requested it. What that does is it saves about 47% of the time for the property manager to provide a rental verification, because it’s much faster, there’s no faxing, or emailing, or calling. The biggest problem that our customers is solving is that compliance part. You know that the questions that are being asked of you are questions that you can provide. That saves up a lot of time, they don’t have to keep up with the latest questions that they can fill out. Jason: Yeah, because being asked questions can be dangerous. The natural inclination we have is to just answer them. Most people want to be honest and you have to be really careful because if they’re asking the wrong types of questions and you provide answers to those, you then can be legally liable. Vitaliy: Exactly. If I could go further the automation part. That is our beginner plan, and then what we also have done is we’ve integrated it with the Propertyware right now. We’re still working on AppFolio and Buildium is next. We’ve successfully integrated with Propertyware where a person is reconnected to their account. Anytime somebody requests for reference, our system goes into Propertyware, looks up the tenant that they’re referring to, looks up all the information that’s on the ledger, and generates a report for them. They have to go in and answer maybe two or three questions, and 90% of them are filled out for you. That saves a lot of time and accuracy because it’s not prone to human error. There’s a lot of things that are built-in that would basically say, “If we can’t find that person,” then it sends an email saying, “Hey, that person’s not found,” and then sends to a manual. That’s the automation part. We’re also looking for people to basically build it out for AppFolio and Buildium. Right now, it’s only working with Propertyware. The other big part is that most people are afraid that, “Hey, does this integrate with the API of Propertyware?” No, it does not require the API. Basically, you don’t have to pay that extra dollar just to have the API. Jason: Got it. If I can recommend another integration partner, I’d recommend Rent Manager. I’m hearing lots of positive feedback about them. They’re one of the first to have an open API, so for connectivity, they play really nice with others. We gave them an award for that. This then helps the property manager on both sides dealing with past tenants that they need to do verifications for and potential tenants that they’re seeking to make sure their verifications are valid. Jason: Okay, so the bottom line is this is saving them a lot of time dealing with this stuff. Dealing with verifications and all this, and time is money. I would imagine your tool based on the cost of whatever the cost is, overall, they’re saving money. The biggest cost in any business is staff. It’s the people. People are the most expensive piece. If you can take this lower level task off their plate, it basically pays for itself, and it’s saving you time. It allows your team to focus on higher level tasks. It sounds like an all around win-win. Vitaliy: Yeah. Initially, we focus on saving time, but the more and more we started implementing this with property managers, the more they realize the biggest benefit is the compliance part, which is a lot more expensive if it’s done wrong. Jason: Legal liability can get really costly. Time wise, incredibly costly. Most property managers who have been in business for awhile probably dealt with a lawsuit of some sort, or a nasty addiction process, or something challenging legally. Just the chance of mitigating that even slightly is probably a significant amount of peace of mind for a property manager. Vitally: Yeah. The other thing is the automation part. I’m not sure, have you ever read a book called The 7 Habits of Highly Effective People. Jason: Yeah, Stephen R. Covey. Vitaliy: Yeah, and I love the part where he focuses on different quadrants. Jason: Right. The urgent, not urgent, and I can’t remember. High priority, low priority, or whatever, something like that. Vitaliy: Yeah, and he says that the biggest problem with most people is they are in urgent and important role all the time that they never get a chance to get to un-urgent but important things. I feel like that is the biggest problem with property managers. They’re trying to do everything themselves and they’re not being effective. They’re getting things done, but they’re not effective. It’s very important for everyone, not just property managers, for me, for you is to sit down and say, “I’m getting all these things done, but am I being effective?” and the only way you would be effective if you spend time in un-urgent but important things. I feel like that’s where people can start focusing. Building their business rather than working in their business. Jason: Yeah. Another way I like to look at it is whether or not you’re reacting. A lot of times as business owners, we end up in a reactive state in which we’re putting out fires constantly. The challenge if you’re constantly putting out fires and your running around with a fire hose like a fire person putting out fires, it takes a lot more energy and work to put out a fire than it does to prevent a fire. If you can set up systems and processes in place in which you can eliminate the urgency and proactively prevent these fires from starting, or from reaching that level—because an ounce of prevention as they say is worth a pound of cure—then you’re going to lower your operational cost, you’re going to lower the noise in the business, you can increase the level of calm that exists in the company, and I love having a quiet workplace. It’s one of the reasons I love working from home and I have a virtual team. It’s quiet. Having a quiet or calm company, I think is probably a goal of every property manager that’s been dealing with so many fires. It makes a lot of sense. Vitaliy: Yeah, I would definitely agree to that. Jason: I wanted to go back. At the very beginning you mentioned that you’ve worked at Apple and some of these other tech companies. Going from working in companies to being an entrepreneur and starting a business, that’s quite a leap. It’s not a leap that a lot of people take. What do you think inspired you to leave working for a company, to running a company? I also am curious, what was it like working at Apple? I’ve got all my Apple products all around me here. I probably got two, three, four, I’ve got like a plethora of Apple products around me. We always hear about Apple as this mythical, magical creature that we should all aspire to be like. What was your experience like working there and how do you feel like that helped you? Vitaliy: Yeah. I got to be careful because I can’t say certain things. Jason: I get it. […] compliance. Vitaliy: Yeah. I got to be careful. Honestly, I loved working for Apple. It was a great place. There’s a lot of smart people there that is the reason why they’re so awesome. Most of my stuff is Apple and I love it. I love their vision and the fact that they love everything to be so detailed. Everything just works well. It shows in even the things that they do for their employees, it was great. There’s a lot of places you can go. They’re subsidizing food, it was like $2 for a meal. They pretty much took care of you. They wanted you to stay there as much as possible. The one thing I didn’t like is it was almost like, “Hey, if you’re at Apple, you’re expected to work,” so you’re kind of expected to work overtime all the time. You have to perform really well. It was a great place for me to not just learn how to get things done, but to get them done from a user’s perspective, which I think is a big thing that I learned there. Jason: One thing you can tell about all of their products is they’re very client-centric in their focus. I’m a big fan of coaching my own clients to be client-centric in their focus, because that’s why a business exists. As I said at the outset of this call, to solve a problem. If you’re not solving a problem for your customer base, then you really don’t have a legitimate business model. If you can help solve people’s problems, not only is it rewarding and feels good, but it also is profitable to be solving real challenges and problems. The level of detail that they go to to prevent problems, and confusion, and questions is just really interesting. I’m a total nerd. I had my MCSE, I did Microsoft stuff in the past, and all of these. I built computers. I did all this stuff but the level of detail in which they put into their products I think is inspiring, and making sure that the consumer has an easy experience, and I think usability is critical. I’m sure that that is something that you’ll learn while being there that you’ve put into your product to make sure that it’s intuitive. People have an easy user experience and it makes sense as they move through the process. Vitaliy: Definitely. An example for how we applied in our company is a lot of times when somebody says, “Hey, go to our website and do something on it,” a lot of website just say, “Okay well, before you do that, you have to register. Create a username and password,” and then they do that, and then they forget where they were, and they get lost. What we did is say, if we’re sending a landlord over to our website, we’re going to let him submit a reference before we let them register. We have that in our system. They don’t have to all fall in into all this register, forgot my password type of deal where we let them do everything step-by-step. Whereas at the end, they’re going to create a password or log in. it doesn’t really matter. We’re working on the user experience. Specifically, we know that property managers and landlords are in the demographic of getting things wrong. They’re average 40-60 years old and they’re not really techies like we are. We have to design in such a way where, they are simple things that you just cannot get stuck on. We definitely implemented a lot of what I learned in Apple. Jason: I think it’s great that we’re pointing this out, because I think a lot of property managers hear this. They hear all this tech background, and they hear that this is an automation. Just hearing the word ‘automation,’ some of them are like, “Oh my gosh, that sounds so difficult. I’m not hi-tech.” This is something that you guys help them facilitate. I’m sure you have a well thought out onboarding process. This is something that they don’t have to be super tech savvy in order to implement in their company, is that accurate? Vitaliy: Definitely. We’ve been ironing out a few are glitches where people get lost. If they get lost we try to figure out, what can we do to prevent that from happening. There is no place where people who are not tech savvy will get stuck on. We’re always looking at those and trying to figure out better ways to do that. There is actually a lot of people you’d be surprised that just cannot fill out the main form. It’s literally a few questions and upload a file, and people just get stuck on that. We have to figure out different ways of presenting it to them that it makes sense. Jason: Yeah. I think the sign of a good product or a good company is there’s always this continual improvement process in improving things. It’s something that we do here at DoorGrow. We’re just constantly looking at where are clients getting stuck, what training could we add, what material could we add, what new thing could we do to improve that so that they can move through it faster or easier, and get results quicker. I think that that’s something that every property manager listening can do in their own business. It’s something to take a look at where are tenants getting confused in your onboarding processes with them, where are your new owners and new clients getting confused in your process when you onboard them and just focusing on how can we systemize that, how can we reduce the drag, or the confusion, or a constraint, and make this easier for them. If you build the processes and build things around the consumer to reduce that friction, then it usually translates into lower operational costs, more savings, and usually more money, more productivity, more profit. Vitaliy: Definitely. It’s a big thing. Going back to Apple, one of the biggest thing I learned there is user experience. A lot of companies that don’t focus on user experience or focus on just what the developers came up with, are usually not profitable. The user experience almost doubles sales if it’s done right. There’s company that start with user experience and then go into coding. There’s all this research that has to be done. Don’t rely on what you think or your developers thinks you need to do, go talk to customers first. Take notes, where do they get stuck. What don’t they like. They’ll tell you, but we just don’t ask. I think that is the biggest problem, we don’t ask them. We think we are the customer, but we’re not. Jason: Yeah, there’s this great book just called Ask. Jason: Yeah, Ryan Levesque. It’s all about asking one simple question like, “What’s the biggest challenge you’re experiencing with X?” whatever X might be. “What’s the biggest challenge you’re dealing with, the biggest problem you’re dealing with in your property management business right now?” It’s a question I love to ask people, because that’s where their pain is, that’s what they’re concerned about. Then I want to see, is there something that we can do to help solve that problem for them. I think one of the challenges we have or blind spots we have as entrepreneurs is, we assume that we know things about our customer when we don’t. We need to ask. I have this in my own business recently, in that any time I’ve asked people like, “What’s your biggest challenge in your business?” it’s always relevant to something they feel I can help with. There was getting leads or growing my business. But recently, we’ve have enough people in our Facebook group now that I posted a poll for all these business owners and ask the business owners, what are your biggest challenges? I build a poll with all the challenges I typically think property managers deal with. The number one thing was maintenance coordination. That was the number one thing at the top of the list, the biggest challenge they’re dealing with. Maintenances can be a huge challenge. The third item was sourcing vendors basically which was again connected to maintenance. Maintenance was a big challenge. Some of the maintenance vendors that we’re able to see that got pretty excited I’m sure. Sometimes we need to make sure that before asking the right situation or context in order to get information that’s usable, instead of information that’s just fed. Now, on the list is certainly growing, getting leads, and adding doors. If that’s a problem that my company is helping to solve and their primary concern is something else, then that’s something we need to start helping our customers with. That was kind of interesting for us to see as a company. I think there’s some serious value. A lot of times we assume our clients are happy, we assume our clients know, and until they implement something maybe like GatherKudos, or until they’re getting real feedback from the customers, they maybe don’t really know how good of a company they are. They really don’t know how good the frontline staff are treating people. I think that that’s a powerful question it’s to ask people, “What is your biggest challenge with your rental property if you’re dealing with an owner or a tenant? What is the number one thing that you’re looking for in a home?” or something like this. The mistake we make a lot of times as business owners—we do these big survey sometimes—we ask too many things because we want to know everything, we want to all the ideas. You can kind of get away with that if you’re on a phone call with somebody. You can ask them lots and be really curious. I’ve done probably thousands of phone calls with property managers and business owners being really curious and asking lots of questions. If you’re doing a survey or want to do something effective as a business owner, to get real feedback from customers, a one word question is usually the best way to do it. you can just send an email to everybody saying, “Hey, what’s the one thing if we offered it, you would pay us additional money for that we don’t do currently for you?” and you may get a whole plethora of ideas coming back to you of things that you do and implement it in your business. Then you let go, “That would be pretty easy to add on.” “That’s totally outside our business model, so we won’t do that,” but you may get some ideas there. Jason: Vitaliy, is there anything else that you feel like people should know about Renter Inc. that we didn’t cover? Any major questions or concerns that people bring up when you’re on these sales calls with them and telling them about your product? Vitaliy: Yeah. one of the biggest things is when people say, “Okay, so you’re storing information in your database that you later can be given to other landlords, is that legal?” that is the biggest question that people ask. We made sure that that is taken cared of. We continually work with attorneys to make sure that all processes and updates that we do are compliant with FCRA, with fair housing, with HUD, to make sure that everything is taken cared of, where people and property managers feel safe using our system. That is the biggest question that people ask. Number two is people ask, “I trust myself with rental verifications. I don’t trust the system to do it better than I can.” To that we say, “Most of the times, our system will be more accurate and more consistent, because you build it once, and it runs, and it’s consistent.” We have places built-in where if we have a doubt about anything, we can always circulate back to the property manager and say, “Hey, our system was not able to generate this information. It needs your input.” Basically, our accuracy is as good or even better than a human because it’s programmed and it has a lot of places where there is checks and balances built-in to prevent that from happening. Number three is people ask, “Well, how does that work without purchasing that API from Propertyware? Do you use virtual assistants to do it for you or what do you do?” To that, I would answer that we have a secret sauce that we use that pretty much is like a robot that goes through as if it’s your personal assistant and they’re actually clicking places, they’re gathering information, or scraping information, and converting it to the correct data, and actually calculating it as if a human is doing it. It doesn’t require an API connection because it’s using the existing system to do it as if you hired a virtual assistant do it for you. That’s how we’re able to reduce the cost for a property manager to use our system, to automate it without the need of Propertyware’s API. The cool part is that AppFolio doesn’t give you an open API, and our goal is to use the same technology to integrate those together without the API. Propertyware has an API but it’s limited API. Whereas with this, it gives you access to pretty much everything you would have as if you’re sitting in front of a computer and doing it. That’s the benefit there. Jason: Yeah, smart. Can property managers use this though in the interim that are on AppFolio, or they’re on Buildium, or they’re Rent Manager, and there isn’t this scraping tool in place? Where there isn’t an API connection in place, can they still use your service? Vitaliy: Yeah, definitely. They can still sign-up, create an account, and then we have free trials for both of our packages. We also have a free plan which limits you from the ability to basically put a company-specific link on your site, but people can get started with that. They can start using the system. The automation part that I’m talking about with Propertyware just makes it faster, but they can still use our system to enter in all the information online. They just won’t save the 90% of the time to do it, but it still gives a benefit, because it’s compliant, and it still saves them 47% of their time. Pretty much somebody who doesn’t even have a property management system and just has a website can start using it. Just by placing a link on their website and saying, “Hey, all the rental verifications are now done through Renter Inc.” Some of our customers even go as far as changing their phone system and saying, “Hey, are you looking for rental verification? Go on our website, go to contact us, and click on verify rental verification.” That saves a lot of time on the phone. I would recommend them to go on our website, check it out, we have a 60-day trial. It doesn’t hurt anyone to get started. I hope that helps. Jason: Yeah, phenomenal. It yes sounds interesting. It sounds exciting. Vitaliy, I appreciate you coming on the show and sharing this with us, and telling us a little bit about your business. How can people reach you? How can they find your website? Why don’t you give us all the details? Vitaliy: Sure. People can find us at renterinc.com and there’s contact information there. I would prefer that people contact us through there. Also for the DoorGrow Show people, we have a little giveaway or a freebie, if somebody signs up with us with a paid account before September 1st, we’ll give them a 15% off. As you sign up, just mention that you heard about us from DoorGrow and we’ll do that for you, but you would have to do that before September 1st. Jason: Alright, thank you for that. I’m sure the listeners will be excited about that. Mention DoorGrow, or the DoorGrow Show if you talk with Renter Inc. and your website is renterinc.com, not rentersinc. Jason: You can get a 15% discount, awesome. Jason: Vitaliy, I appreciate you coming on the show. Thank you so much for coming out and I’ll be excited to hear some feedback on some clients that are using your services. Vitaliy: Can I add one more thing? Vitaliy: Yeah, so we’re looking for people that are using AppFolio and Buildium to start working on integrating the automation part. If somebody is on AppFolio and they like the idea, somebody’s on Buildium, we need to get a few people together so we can work together to automate that part. We have enough people on Propertyware, but AppFolio and Buildium is something that we’re looking forward to. If somebody wants to try it out, contact us. We’d love to connect with you and definitely give you a discount for being the first people to use it. Jason: There you go. If you want to be a beta tester or a guinea pig, you get some discounted rates and you’ll be one of the early adopters, one of the first to have this. I think that’s kind of exciting for some of our listeners. I appreciate you sharing that. Thanks for coming on the show. Vitaliy: Thank you so much. Jason: That was an interesting interview. If you enjoyed this, then be sure to like, subscribe. If you’re on YouTube, if you’re on iTunes, be sure to leave us a testimonial or a review. We really appreciate that, and share your feedback with others. That helps us out. Those of you that are listening, make sure you get inside the DoorGrow Club, our Facebook group. It is a free community full of property management entrepreneurs and the business owners. They are contribution-focused, they’re making a difference, they’re sharing ideas with each other, and it’s just awesome to see the momentum that’s created. We get our own momentum by bringing it to others. I love seeing the level of contribution in that group. We hit 1800 business owners, 1800 members inside that group which is ridiculous. There’s other groups that are larger, but there’s a few groups that are as potent and powerful. I think it’s just been a phenomenal resource and I appreciate everybody in there that might be listening to the show. Thank you to all our listeners and viewers. Be sure to share this with others if this was interesting. Bye everyone.